I love picking up ideas when we travel. 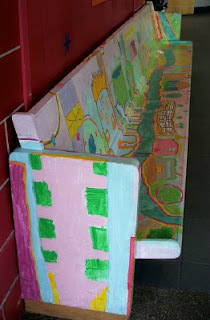 These handpainted benches at the Creative Discovery Museum blew me away! 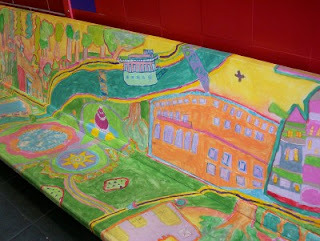 They were painted by middle schoolers and depict Chattanooga's past and future. Can't you envision a pair of these in a sunny, modern kitchen or dining room? I love these benches, too, Meredith. I am going to keep this idea in mind for the future. They're very, very neat. I am the same way on vacation. I take a little notebook that I keep with me, in my purse, and write down neat ideas that I see at the places we visit and stay. Now that we have a digital camera, capturing the actual look will be easier. I think there must be something about stepping out of your own routine that opens your eyes to creative things around you. Enjoy tomorrow! My husband and I have been planning for a few years now to have each of our children paint a wooden chair for the dining room, picking their own colors and designs. We like the idea of none of the chairs being the same (I like mis-matched silverware also). I guess we had better get to looking for those chairs before our oldest grows up and leaves the house, lol!